I wasn’t sure which time zone Vietnamese roosters were operating on, but certainly it wasn’t the local time zone. Being woken up at 3:00am is just a bit too early for me. At 6:00 it was time to get up though: Shower, breakfast and saddle the bikes. It was 8:00am when we left Mai Chau where we spent Day 1. If we had known before how this day will turn out, we might’ve stayed in bed just a bit longer….Before we set of, our guide asked whether we prefer the easy option or “a bit off-road”. 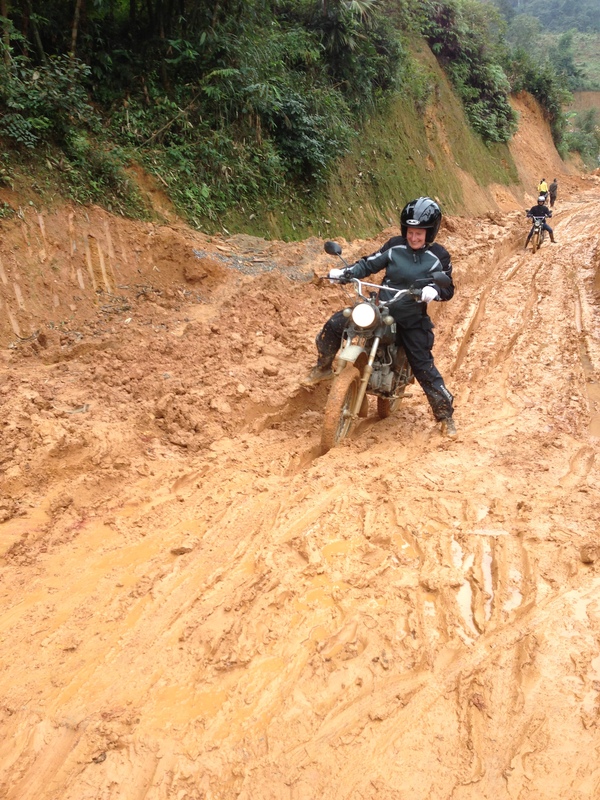 Since it didn’t rain and we all had enough biking experience we thought a bit “off-road” is just fine. How we were wrong…. We started with some fantastic piece of road. It didn’t rain and the road (nice tarmac) was winding up through the mountains. The scenery was stunning, valleys appearing and disappearing in clouds. It was as good as it could be and we enjoyed ourselves tremendously. Just look through the photos. I know I repeat myself, but Vietnam is really a brilliant, brilliant country. At first, the street became a bit muddy. Not much of an issue, you just need to be careful with the gas as the rear wheels had a tendency to slide away. But then, it became really muddy! And by “muddy” we’re not talking about a bit of dirt. No, we’re talking about 30cm to 50cm deep mud. The mud wasn’t a big issue for the Minsk though. Staying true to her reputation as the “Kalashnikov among motorbikes”, it just went through the mud like nothing. It mainly came down to riding skills and that’s where our guides stood out and we were just pathetic! Our tour guides just flew through the mud. We, on the other hand, struggled as the videos here show. The videos just show the easy part we went through. During the tough stretches we were busy cursing, fighting and sliding through the mud and couldn’t be bothered taking out the cameras. I myself crashed once with my leg buried once under the Minsk. The rest of the team was way behind so I was lying in the mud and couldn’t move as my left leg was trapped under the bike. I became the attraction for the local villagers. After five minute a guy came running towards me to help me. As I didn’t want to make an entire fool of myself I managed to lift up the Minsk by myself and continued the struggle through the mud. It took us around three hours to pass through the 4 or 5 kilometres. We sweated, cursed, laughed and cried. When our guide announced “No more shitroads, man!! !” we knew we made it through. As it turned out, this was the toughest part of the trip. But looking back, we loved it! We didn’t know at this stage about a few road accidents and a climb through the mountains that were still ahead of us….